I have enjoyed reading blog posts about Project Run and Play before, but I have never participated before. 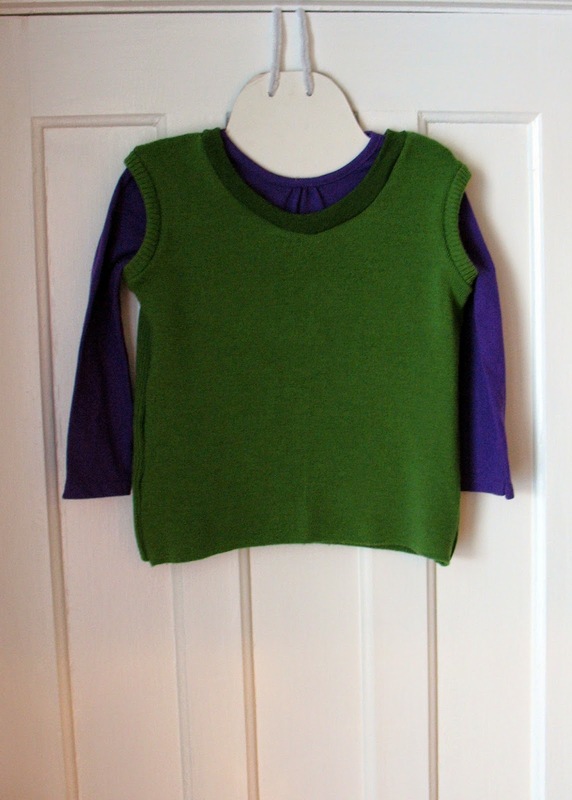 I was inspired by the sweater vest that Angela from Snippet made for her daughter. We've had a cold and snowy winter making it hard to imagine making anything sleeveless until I saw her sweater vest. After making the Mademoiselle Muscle Tee pattern as a sweater vest I think I will try it again for summer wear. I'm still on an upcycle kick after Kid's Clothes Week. I upcycled a sweater which allowed me to use existing hems. The front of the sweater was knit in one by one rib and the back in two by two rib. I used the one by one rib to bind the arm holes. I had just over four inches of one by one rib left after cutting out the front of the vest, so I bands are a bit narrower than the pattern recommended. I didn't have enough fabric left to add a band to the neck so I used some cotton jersey from my stash. I'm not sure if it needs any embellishment. Any suggestions? I like the vest! I think I would leave it like this. I would "embellish it by putting a shirt with print under it. Great first time participation in Project Run & Play! Keep up the great work.